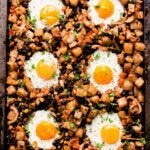 This dairy-free breakfast casserole with potatoes and eggs is the perfect family pleaser. 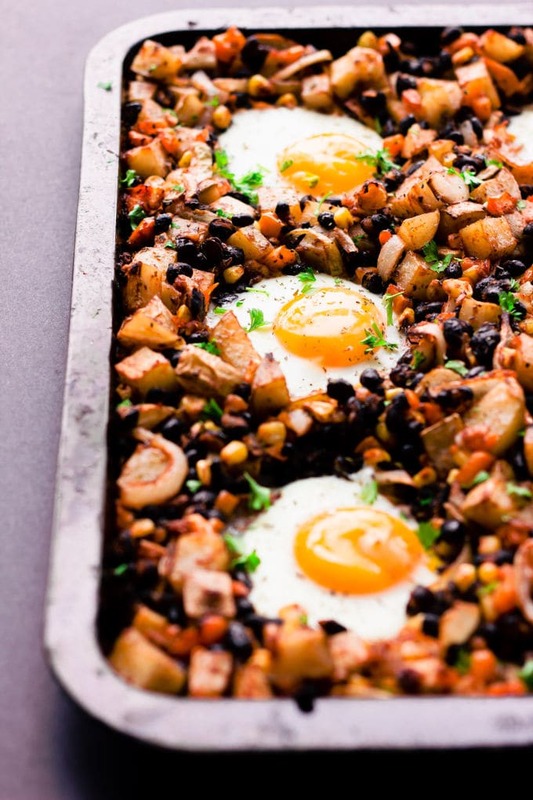 You will love this super healthy breakfast bake as it is quick and easy to make, but also because it is the perfect meal idea for picky eaters. This kid-approved recipe is also gluten-free, vegetarian and could be made paleo by replacing two simple ingredients. I love breakfast. I’d say it is my favorite meal of the day. It’s the only meal where I could eat the same thing over, and over again, day after day, for weeks. It’s usually 2 eggs with a side of toast and fruits. 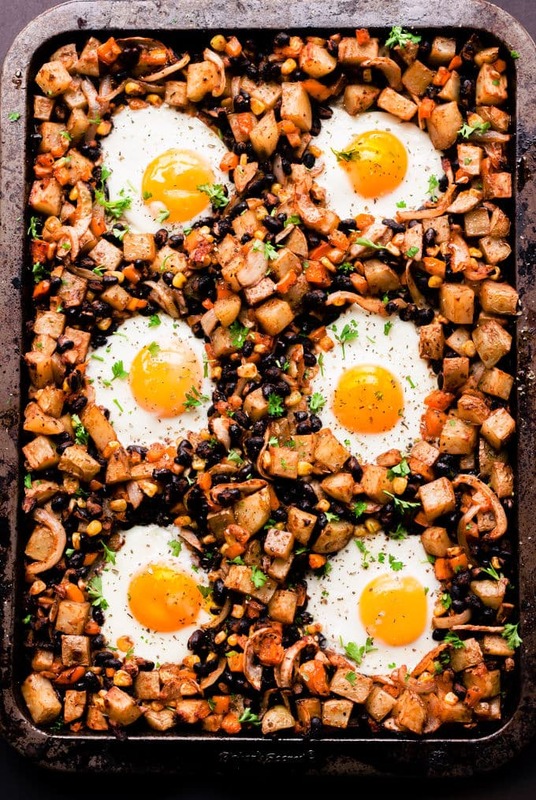 But sometimes, one can get tired of even the most enjoyable things… And when that happens, breakfast is usually going to be something like a frittata or a casserole, something very easy, like this recipe. This recipe is also perfect when you have several mouths to feed. 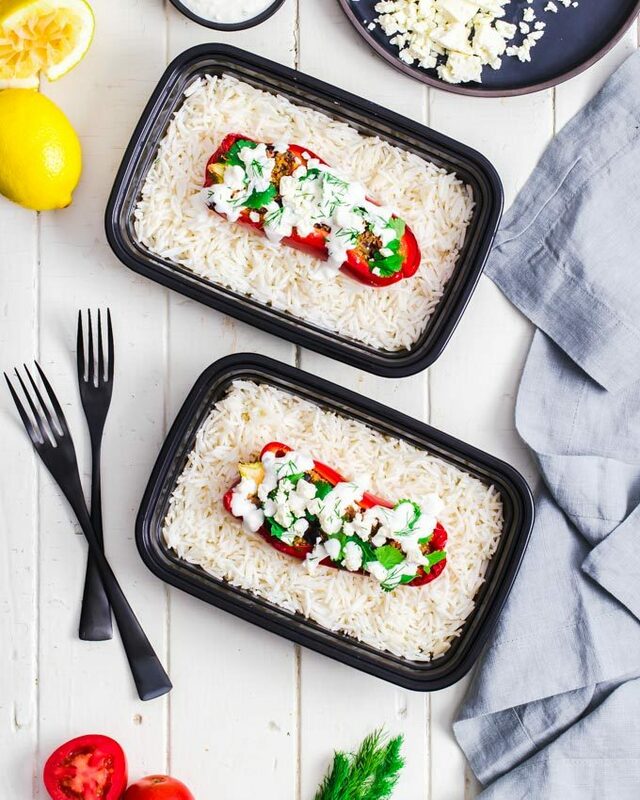 Cut it, mix it, throw it in the oven… Done! 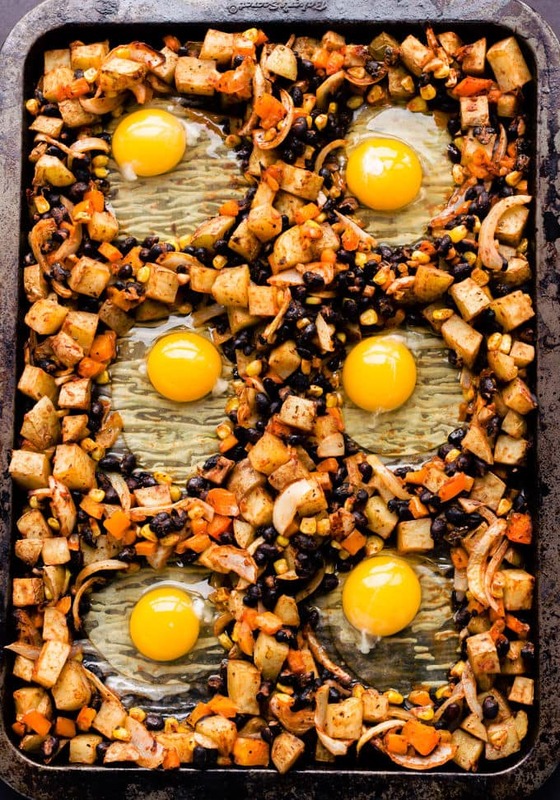 Now enjoy a delicious cup of coffee while this amazing sheet pan breakfast roasts its way to perfection. Ahhh… love it. 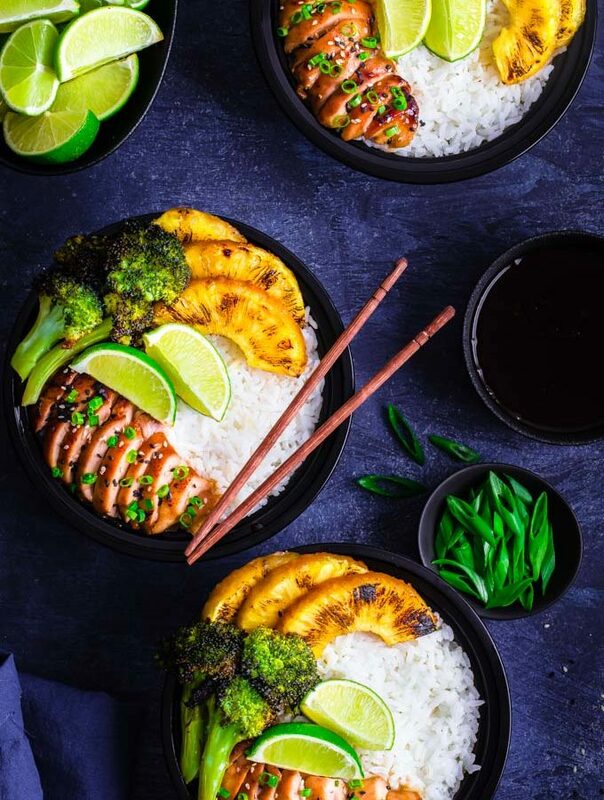 This recipe is packed with protein, good carbs and essential nutrients to make sure you stay full and energized until lunch. 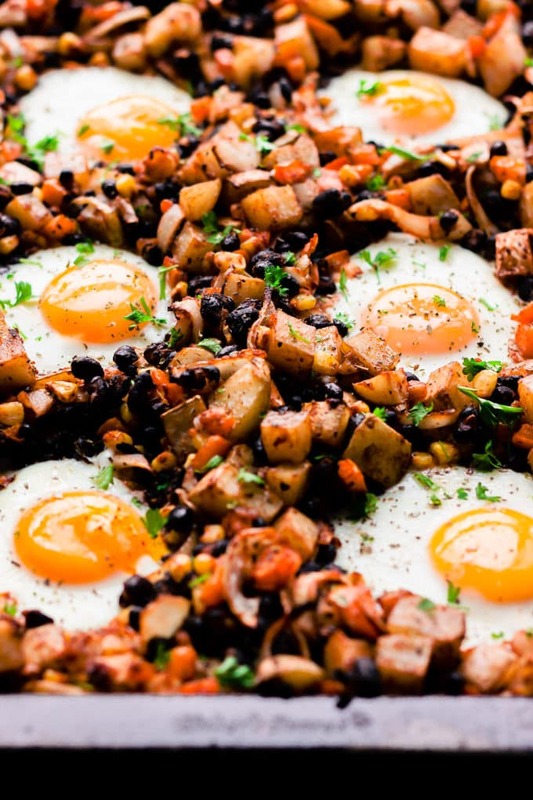 It would also be perfect for brunch… or even dinner, I won’t judge. 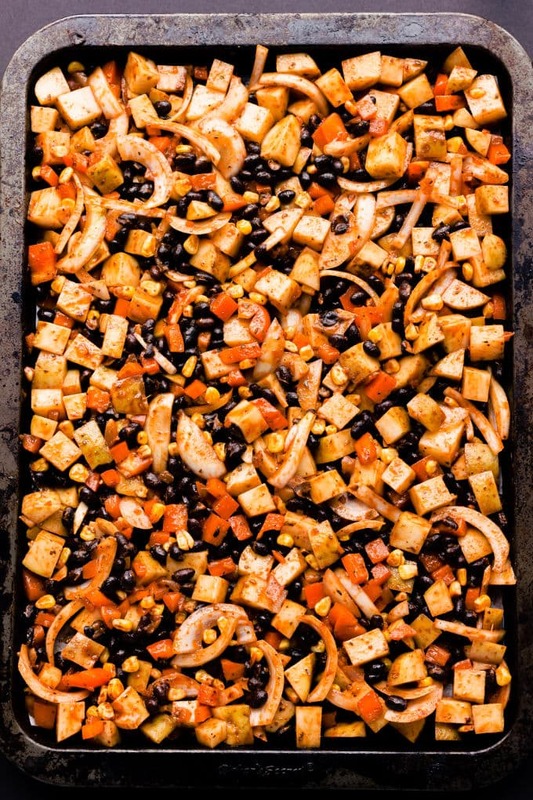 For a paleo version, replace black beans with about 1 ½ cup cooked lean ground beef and the corn kernels with the same amount of green peas or carrot cubes. 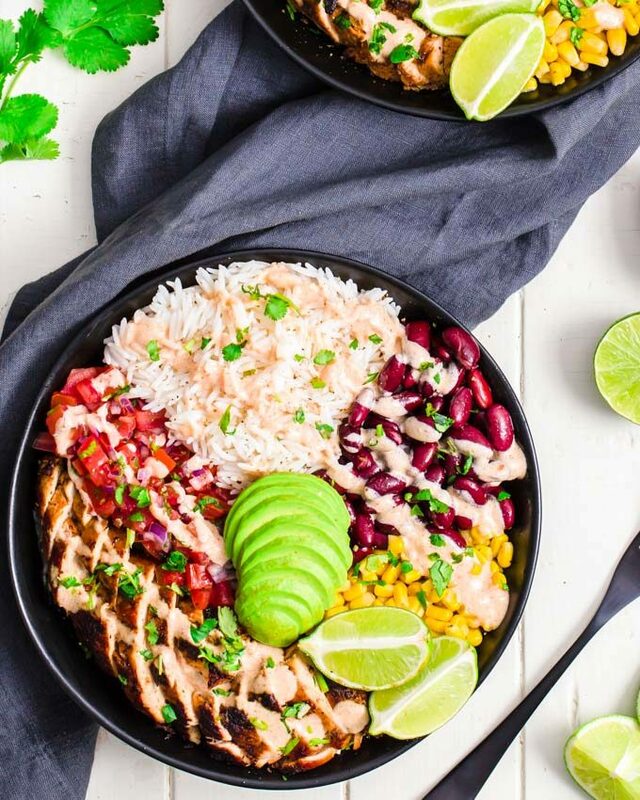 The spices in this recipe are of Mexican inspiration, but you could replace the cumin, chilli powder, dried oregano and paprika with about 1 ½ to 2 tablespoons BBQ spices if you’d like. Lastly, if you want your egg yolks to stay runny (That’s what this recipe is all about! ), don’t overcook them. Have you tried the recipe? Did you like it? Please tell me in the comments section below. I’d love to know! Mix all of the ingredients in a large mixing bowl then spread equally on your baking sheet. Bake for 35 to 40 minutes or until the potato cubes are soft. Take the baking sheet out of the oven and make 6 wells using a spoon. Crack an egg into each well. Return to the oven and bake for an additional 6 to 8 minutes. Egg yolks will harden quickly, do not overcook if you like them runny. 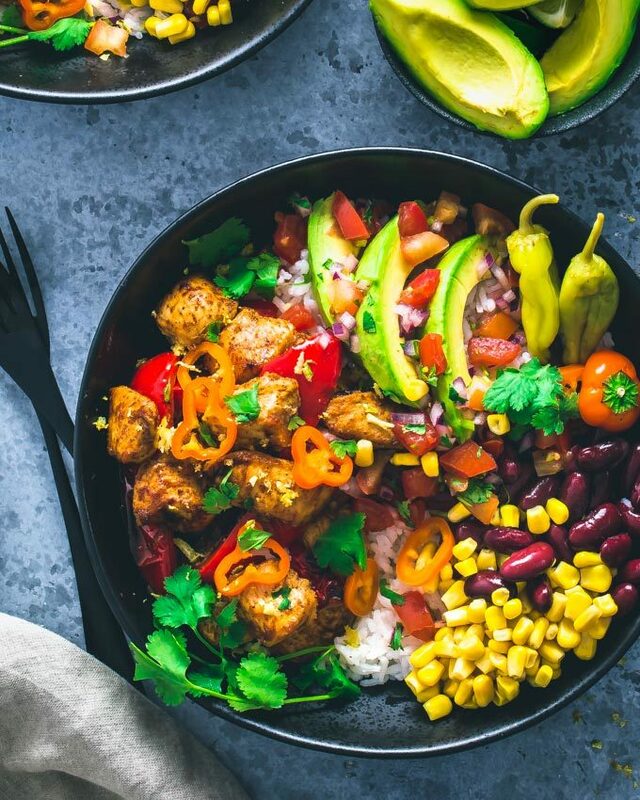 For a paleo version, replace black beans with about 1 1/2 cup cooked lean ground beef and the corn kernels with the same amount of green peas or carrot cubes. Whole30 Breakfast Casserole (Vegetarian, Paleo) Eggs and Spinach Breakfast Lettuce Boats Vegan Buckwheat Pancakes (Gluten-Free, Healthy) Banana Mug Cake | Healthy and Gluten-Free! Delicious!!! Rave reviews from guests. Make sure to not overcook the eggs. I did extend the time because I wasnt sure if they were done, but it was too long. Will be making again and cooking the eggs for less time. Welcome! I'm Gabriel. Canadian Food Blogger and Real Food advocate. What you will find here is a collection of delicious healthy desserts, clean protein snacks and healthier versions of your favorite food. Enjoy your stay!